It’s so hot that my nails just had to be painted with a hot summer color. Today the choice was Eveline Gold Colors 512. 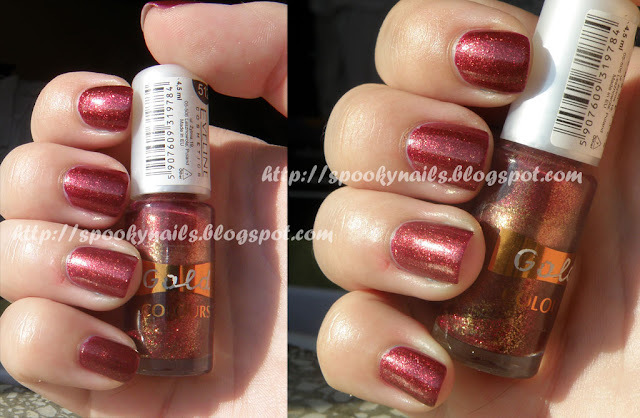 A copper-red-gold color with lots of sparkles. In the first picture there are two layers without topcoat (in direct sunlight), the latter is with topcoat (daylight). It’s very easy to apply, the drying is in normal. One time I covered it with Essie Matte About You and it changed to a polish with a suede finish. It’s worth to try it, because it’s very cheap but the effect if very nice. Fabulous blog, I just joined as a follower ;)glad I found you and I love that lacquer on you. Can I ask where you are located? I don’t recognize that lacquer name at all and I’ve been swapping internationally for a while? I live in Poland and this is Polish brand :) It’s very very cheap brand, most of them costs about 1$, most expensive costs 3$ :) Check also holos: http://spookynails.blogspot.com/2010/06/moja-kolekcja-holo-my-holo-collection.html .